and experience to perfect it. We provide full body esthetics for both men and women. From chemical peels and microdermabrasion to full body waxing we can cater to any need. All of our treatments can be customized to provide you with the latest in relaxation and beauty techniques. Add length, thickness and fullness to your natural lashes with semi permanent eyelash extensions. They are a great way to enhance your eyes with little daily maintenance. With many lengths and thicknesses to choose from we can customize any look. 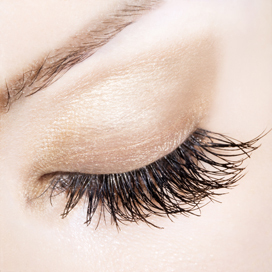 Eyelash extensions are individually applied to your natural lashes one lash at a time. Are they safe for my eyes? All of the products that we use are free from formaldehyde and completely safe. We do recommend removing contact lenses during your treatment. When will I need a fill? Fills are recommended every 2-3 weeks to maintain the best care for your lashes. Can I swim with them? Your lashes are waterproof but the less you get them wet, the longer they will last. Mascara is not recommended on your eyelash extensions. What if I want to have them removed? 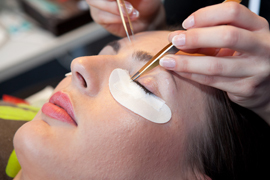 We remove the lashes with a gel remover that dissolves the adhesive so that the lashes are safely removed. We do not recommend removing them yourself. Become a professionally trained and certified Eyelash Extension Artist by completing our advanced training for Licensed Cosmetologists and Estheticians. Our classes include a professional kit which includes all tools and supplies you will need to begin your extensions once you have completed the course. Our small class sizes, numbering 6 students or less, insure plenty of one on one time with a live model. In addition to the tools and supply kit you will receive a certificate of completion verifying your achievement.